Are you looking for bed bug covers for your pillows? What are bed bug pillow covers? How do you care for a bed bug pillow cover? Are bed bug pillow covers effective? Invading bed bugs can be a huge and very frustrating problem for anyone. If left unchallenged, a few seemingly harmless bed bugs can easily turn into an entire army of stubborn and annoying blood suckers. This Pest Strategies review will walk you through the best bed bug pillow covers of 2019. Are you getting excited for our list? Of all the Dust Mite Covers we researched and reviewed, our top pick goes to the ​SureGuard Pillow Protectors. We chose SureGuard Pillow Protectors because these encasements are basically designed ​to effectively deny bed bugs and even dust mites any point of entry. The pillow protectors are geared with Invisi-Zip Technology ensuring total protection for your pillows. 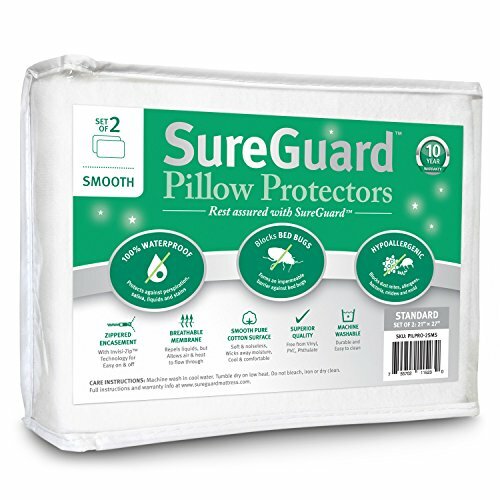 ​Like most pillow covers, SureGuard Pillow Protectors offer complete protection from any form of liquids and stains that help make your pillows looking good as new for months on end. Another bonus is that it offers allergy relief from pollen and pet dander down to mold and mildew. Want to learn about the rest of our top picks? Continue reading! ​What Are Bed Bug Pillow Covers? ​How Do Bed Bug Covers Work? How ​Do You Find The Best Bed Bug Pillow Covers? ​Are Bed Bug Pillow Covers Effective? ​How To Use And Care For A Bed Bug Pillow Cover? ​Are Bed Bug Pillow Covers Safe Around Children and Pets? Are you short on time or just want a quick answer? Check out our list below for a summary of our results. Keep on reading to learn more about bed bug pillow covers. ​The term is somewhat self-explanatory. However, it's not as simple as that. Standard pillow covers are a special type of encasement designed to efficiently extend the expected lifespan of a bedchamber cushion by protecting it from wear and tear and all types of fluids and stains. Bed bug pillow covers on the other hand, have an additional layer of protection. 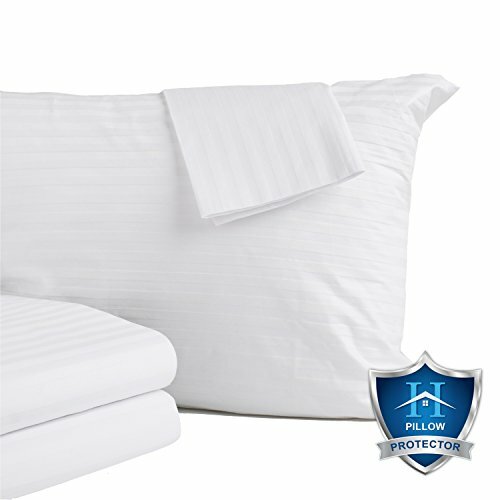 Special fabric and zipper technology seals your pillow from all possible points of entry. ​The bed bug proof fabric and zipper help prevent infestations from flourishing and provide you with stress free nights for wonderful days ahead. Read more: Click here to learn more about bed bugs. ​Bed bugs can live in family homes, apartments, hospitals, offices, and other types of commercial establishments. They also thrive on vehicles as well as boats and airplanes. The bottom line is that bed bugs can live and survive anywhere. But in our homes, they usually thrive in the living room and most especially in your bedroom. Bed bug pillow covers are designed to deny these nocturnal insects any point of entry into your pillow. 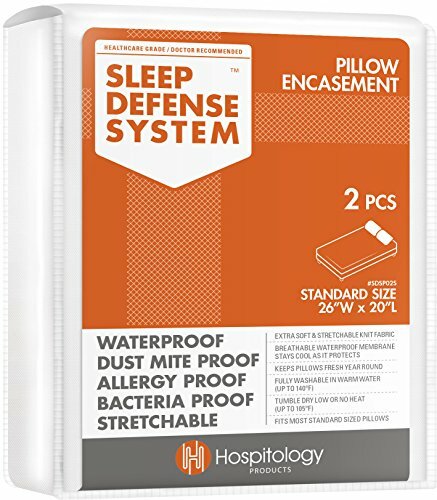 Through it super fine Invisi-Zip zipper, these pillow protectors can effectively seal off your entire pillow to prevent bed bug infestations underneath your head. And to ensure total comfort and bite-free experience throughout the night, these covers are supplemented with special features that can protect your cushion from the usual wear and tear, stains, and a spectrum of allergens. Read Also: What're the best bed bug covers? ​Today's bedding market is practically flooded with thousands of pillow covers with special features. Unless you are down with finding needle in a haystack type of task, it's best that you know what you really need for bed bug free nights. The first thing to look for is the pore size of the pillow cover. Encasements designed with the smallest pores offer the best possible protection against all types of allergens as well as bed bugs and dust mites. The finest covers have a pore size as small as one micron to offer first-rate protection. Also look for Invisi-Zip feature that can stylishly seal off your pillow from all types of invaders. Another essential feature to consider for a bed bug pillow cover is a breathable membrane. This ensures that heat won't get trap inside your pillow for superior comfort throughout the night. 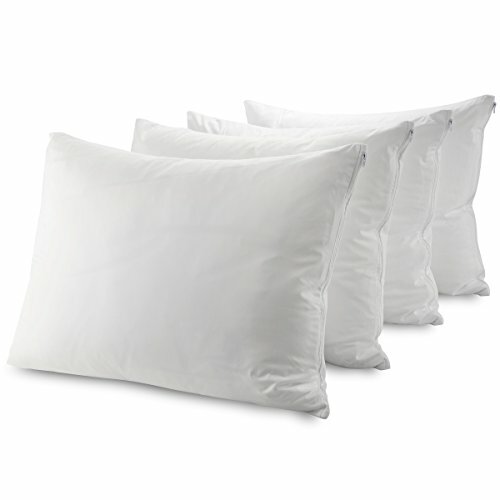 Pillow covers offering great breathability have pore sizes ranging from three to four microns. Lastly, you'll want your pillow cover to be free from all sorts of liquid stains - perspiration to your very own saliva. These pillow cases are made with advanced fabric technology that can effectively wick away moisture and keep you comfortably drier throughout the night. ​The following video will give you glimpse on how a bed bug infestation looks like on a pillow. ​It's both Yes and No. What's important is that you need to focus on the primary reason why you are looking for a bed bug cover - prevent bed bugs from penetrating and eventually thriving inside your pillow. In most cases, buyers are deceived into buying a supposed bed bug pillow cover that focuses more on other special features such as a breathable membrane and water resistance. Although these features are also critical in helping you secure a good night's sleep, it also compromises the case's efficiency in denying bed bugs entry to your pillow. Also bear in mind that the main and only function of a bed bug pillow cover is to prevent these insects from penetrating into your pillow. The enscasements are not there to control the bed bug population. ​Bed bug pillow covers are designed to last for about 10 years or more. However, this expected lifespan can only be realized if the product is cared for properly. ​It is best to wash the bed bug cover first before using. This helps softening up the fabric of the pillow case and in effectively removing any unwanted odor. Wash your pillow case with a normal detergent but without the use of bleach. Bear in mind that bleach products can compromise the encasement's waterproof capability. It is also not recommended to dry clean your bed bug pillow cover. Dry your pillow cases on low heat. High heat drying can damage the fabric and lose the cover's overall efficiency. ​Bed bug pillow cases are totally safe to use around children and pets. These special bedding encasements are typically hypoallergenic and are free from vinyl, thalates, and other harmful chemicals. As a quick recap, here are the five bed bug covers we looked at. Our #1 pick goes to the ​SureGuard Pillow Protectors, but the rest of the list might be more suited to your needs. 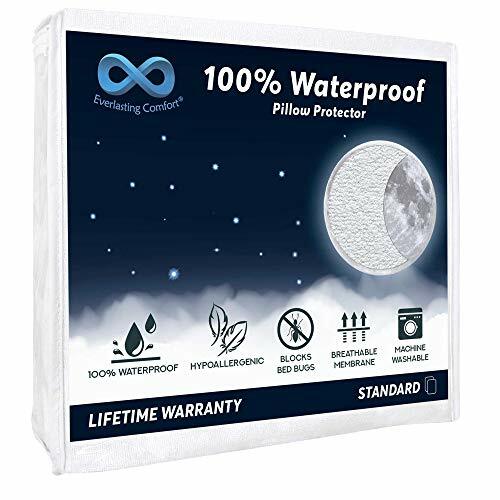 Be sure to take a look at the ​Everlasting Comfort Pillow Protector ​if you are looking for a cotton terry cloth with a breathable membrane. This pillow protector promises to keep you dry throughout the night especially if you are the type of person who drools at bedtime. But perhaps you are wondering why a 100% cotton terry gets to become a waterproof case. Basically, a plastic lining beneath the terry does the trick. ​The cases are made to last but are also free from vinyl, pthalates, and PVC so it's definitely safe for everyone in the family. Just make sure though that you maintain your pillow cases through cold bleach free machine wash and then dry 'em off on low heat. Even with its super fine zippers and Invisi-Zip technology, SureGuard Pillow Protectors guarantees fresh and nice airflow through your cushions all night long. It blocks all types of allergens as well as your bedroom arch nemeses - the dust mite and the bed bug. It's light as a feather but works great on a down pillow. ​Another great alternative for those who sweat heaviliy at night, this pillow protector promises to keep you dry throughout your sleep. The case is equipped with a polyester membrane which helps kee p the moisture out while securing a good airflow for your pillow. ​This pillow protector is designed with a double layer protection to make sure that all types of allergen will never be able to penetrate through the surface. And at the top, the cotton terry fabric makes sure that you enjoy utmost comfort. ​This pillow protector by Great Bay Home has a tight weave membrane for ultimate protection. It has a pore size of 3 to 4 microns that can effectively block all sorts of allergens along with dust mites and bed bugs most specially. ​And of course, smaller fabric pore size means extending the life of your pillow as it gets shielded from the usual wear and tear, saliva, perspiration, and stains. You also won't have a problem finding the right fit for your pillows as these cases are made available for Standard, Queen, and King size options. These pillow protectors however, need to be washed once every three months to keep them in tip-top shape. If you really need to bleach 'em, use a non-chlorine formula. ​Like the rest of the entries on this list, GuardMax Pillow Protectors are true to its name in guarding your pillow from bed bugs and dust mites with its super fine zippers. ​These cases deliver a double layer protection which feels soft and smooth on the outside but impermeable on the inside. You also will not have to worry for crackling sounds as it is designed to deliver quiet and relaxing nights. It is made of 100% polyester with a polyurethane backing. It is also odor free and hypoallergenic. ​Another viable option for relaxing and hassle-free nights, these pillow protectors basically have everything you need. ​The covers are made of polyester fabric making your nights extra cool and soft. They're also equipped with a breathable but impermeable membrane so that heat won't get trapped inside your pillow without allowing any fluid (saliva and sweat) to pass through. ​What's nice about this product is that it delivers healthcare level bedding straight to your own bedroom. It features a 1ml thick polyurethane waterproof layer paired with an ultra-plush knit fabric so that you can totally relax and enjoy your sleep every night. ​We all want full and hassle free relaxation in our bedroom and in most cases, our pillow cases are the key to enjoying one. ​With thousands of options made available in the bedding market, it can be very challenging as well as frustrating for any buyer to shop for a reliable pillow protector. All of them will work to one degree or another, but there can only be one winner. Overall, our pick goes﻿ ﻿﻿to﻿ ​SureGuard Pillow Protectors. ​It works perfectly in blocking bed bugs and dust mites as well as all types of allergen. It has a super fine Invisi-Zip Technology that offers an aesthetically pleasing appeal and reliable durability. ​It offers the most number of size options including European, Toddler, and Travel so it's an encasement for everyone and for all occasions. It has a soft terry cloth outer surface and practically noiseless. A close second is the Everlasting Comfort Pillow Protector because it is ​is also waterproof but impermeable to all types of bedroom fluids. Curious about other bed bug related products? Check out our other detailed guides to help you deal with your pest problems.